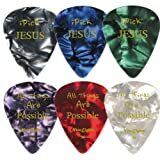 Yes, when you Pick Jesus, All Things Are Possible! No problem is TOO Big for God. To encourage yourself, your friends, and your loved one. Just CLICK the “Add to Cart” Order Button at the Top Right of the Page NOW!